Texas A&M International University’s (TAMIU) Online Master’s of Science Degree in Criminal Justice Program (MSCJ) has ranked favorably in two separate online ranking systems that score the top Criminal Justice master’s degree programs in the nation. OnlineColleges.net ranked TAMIU’s Online MSCJ program No. 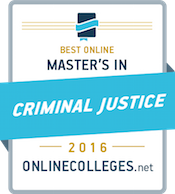 25 among the Best Online Master’s in Criminal Justice Degree Programs in the Nation. The Program also received a ranking of No. 31 on Value Colleges’ (valuecolleges.com) 2016 rankings of the Top 50 Best Value Online Graduate Criminal Justice Programs. For its Best Online Master’s Degree Programs rankings, OnlineColleges.net used a complex methodology that compares academics, student experience, financial aid and enrollment in the online masters in criminal justice programs, resulting in a clear picture of the best offerings in the countries, Dr. Venable said. According to the OnlineColleges.net, its team has spent hundreds of hours reviewing the institutions of higher learning in every state and collecting the data points from each school that it considers to be the greatest indicators of a quality education. Meanwhile, the Best Value ranking starts with regionally accredited criminal justice schools and ranks them according to its own formula, using data gathered from U.S. News & World Report Ranking on 2016 Online Graduate Criminal Justice Programs, PayScale’s 2015 College ROI Report, and Actual Tuition (as reported from school website). Dr. Claudia San Miguel, TAMIU associate professor of criminal justice and chair of the Department of Social Sciences, said that the goal of the TAMIU MSCJ Program is to guide students through coursework that provide a better comprehension of contemporary crime problems and the viability of potential policy and agency responses to crime. “Guidance occurs through engaging teaching styles as well as individual support to students in the program,” she said. Focus is placed on criminological theory, research in criminal justice, and the administration of justice including policing, corrections, ethics, and legal students, Dr. San Miguel explained. The program is entirely online and each course is only five weeks in duration, which allows students the flexibility to complete coursework while working full-time or part-time. Students can complete the program in 1.5 years, a significantly shorter timeframe than most graduate programs across the country, she said. Students also benefit from the cost effective nature of the program, which is significantly more economical compared to other programs across the nation, San Miguel said. Additional benefits include the composition of program faculty, she explained. Spring Registration is currently underway at TAMIU. Classes begin Jan. 20. TAMIU offers Flexible Scheduling entry for graduate students, thus allowing entry into graduate programs at various points within a year. For more information, please contact the Office of Graduate Studies and Research at 326.3020, email graduateschool@tamiu.edu or visit offices located in Student Center 124.